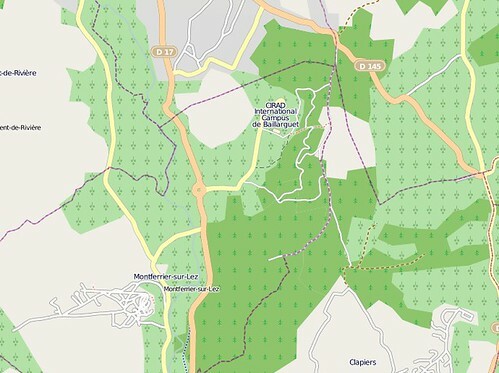 This fall I'm working in office space graciously provided by the Centre de Biologie et de Gestion des Populations at the CIRAD International Campus de Baillarguet outside Montferrier-sur-Lez [OpenStreetMap]. My wife is a visiting scientist here. I'm baggage, but extremely well-treated baggage. I share a corner office with a population geneticist who is waiting for his space in the new wing to be completed. There are bioinformatics programmers diving into Python next door. The internet mostly (c'est le Sud) works, and everybody is friendly and tolerant of my mediocre (terrible, really) French. That's an image capture from 2009-10-16. Yes, I've heard about the OSM static map API, just waiting till it moves to what looks like a more permanent URL. 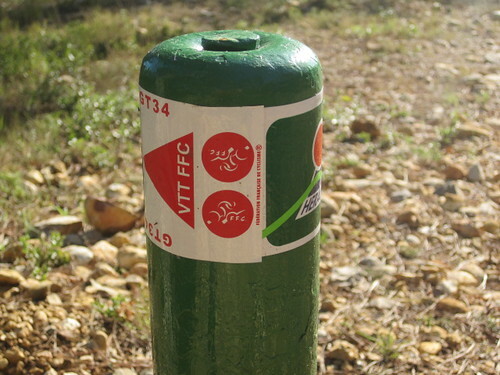 CBGP is out in the countryside north of the Montpellier metro. I've alluded to how pleasant it is out here and recently took a camera on my run to try to capture the feeling. 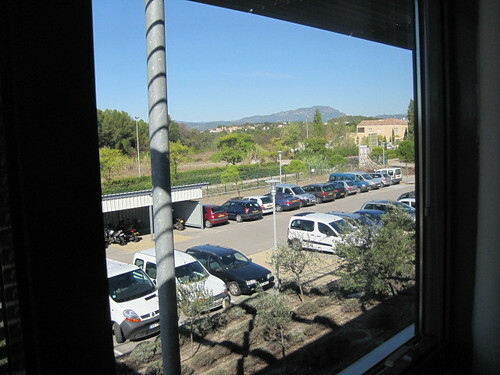 Here's a view out of my office window of the parking lot and the Pic St-Loup hill to the north. One of my favorite local wineries is tucked under the cliffs on the other side of it. 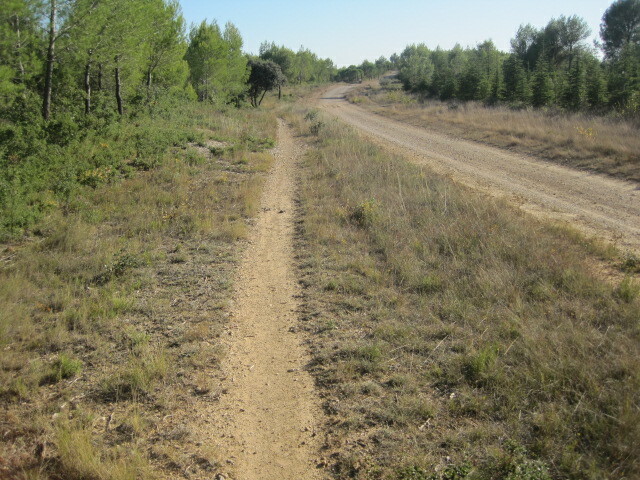 A semi-wild, wooded ridge runs for some kilometers to the east of CBGP. Here's the steep trail (which I've edited into OSM) up the hill from the back door of the Centre. 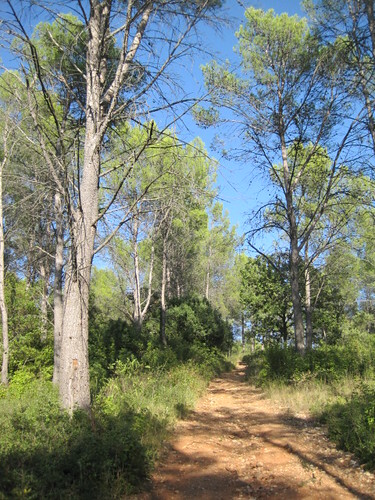 I'm sorry that I can't identify the trees (update: there's a least two p. pinea, or stone pine, in the photo). There's an interesting mix, including what appear to be firs near the top. A little elevation makes a big difference around here. Single-track and fire road on the crest. Sometimes I forget I'm in France and feel like I'm back on the Front Range. You may have noticed the group of identical conifers on the right side of the last photo. There was a 50 hectare fire here in 1981. 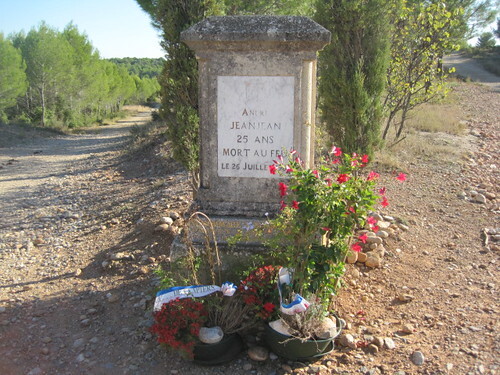 André Jeanjean, A young volunteer sapeur-pompier, died fighting the blaze. I found fresh flowers from the Mairie of Clapiers at his memorial. The left fork there runs down to a vineyard and on into Clapiers. I desperately need to acquire a mountain bike because CBGP is a great trailhead for some nice long rides.